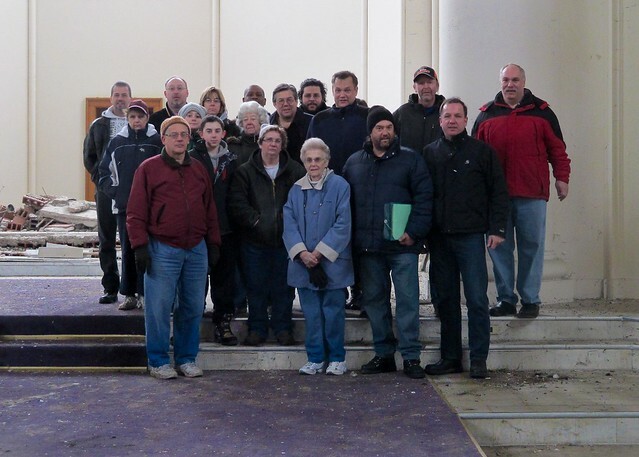 Members of a St. Matthew's facebook group had an opportunity recently to tour St. Matthew's Church on East Ferry Street (google map). 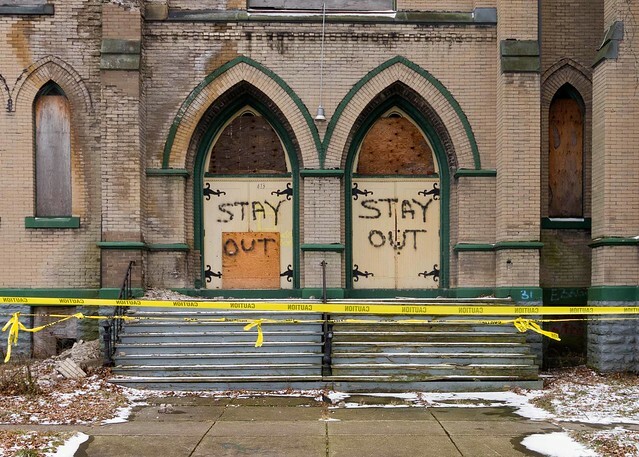 While the collapse of St. Matthew's is well known to neighborhood residents and fixBuffalo readers - see archive for pics/posts - many of the former parishioners witnessed the remains of their former place of worship for the first time. One former student drove all the way from Ohio to see what remains of St. Matthew's. He brought his daughter and other former students, now living in the suburbs, brought their children. One couple retraced their walk down the isle from 27 years ago. After describing the failed attempt to flip the church on ebay and the recent $1 sale, the tour group visited the choir loft and recounted stories of the school's music teacher. At the end of the tour I encouraged everyone to consider engaging in the City's new dialog around preservation and investment. To get started, I suggested they join The Campaign for Greater Buffalo and/or visit the new art museum on Elmwood, the Burchfield Penny. The facebook group is open. Check out the recent comment stream and pics. See this flickr archive for additional images of St. Matthew's. Here's a look back at some of the places I've seen this past week. If you're not familiar with the locations you can see them on the flickr map next to each photo. In some cases I've provided a description of the place or links to additional information. To see the individual photos and related maps, follow this link or you can view the series as a slideshow. The bricks started falling from this mixed-use commercial building at 245 East Ferry Street yesterday (google map). The yellow ribbon appeared this morning. Can the bulldozers be far behind? The current owner, Full Gospel Mission Inc., purchased the building in 1982. 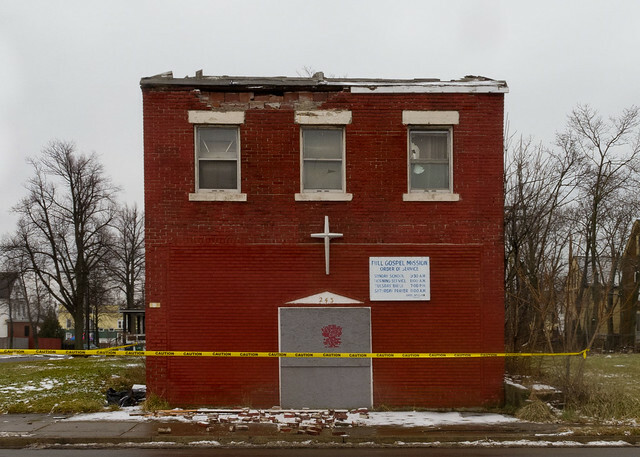 According to City records a Housing Court case wrapped up in April 2010 with a signed affidavit indicating the owner's consent for demolition. And according to New York State records the entity - Full Gospel Mission Inc. - no longer exists. The abandoned store front church at 245 East Ferry is the last reminder of a former vibrant city block that was once lined with mixed-use commercial buildings between Welker and Verplanck Streets. The same entity owns the empty corner lot at 247 East Ferry, directly opposite one of the City's most popular soul food restaurants - Gigi's. One of the East Side's most important commercial intersections is one block away - Jefferson and East Ferry. Here's a side view of 245 East Ferry from earlier this month. The building appears to be structurally sound. It seems counter-intuitive to demolish a building like this given it's condition and proximity to an existing commercial corridor. A creative reuse plan for this property may have short window. 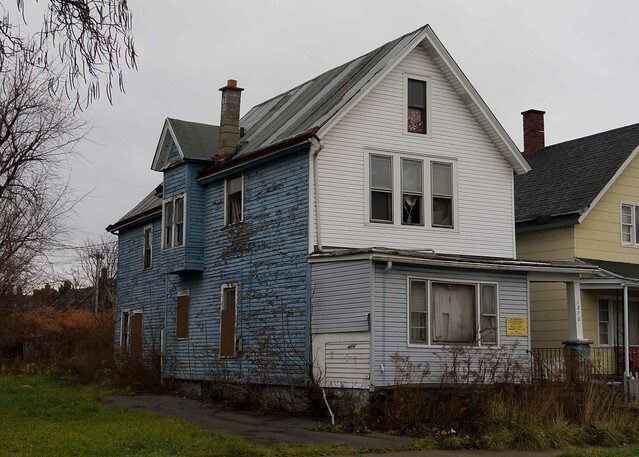 Two months ago the City's Real Estate Division forwarded a proposal to demolish 24 City-owned properties to the Preservation Board for its comment. The Preservation Board recommended against demolition of these properties, but I've been told the City intends to move forward with the demolitions anyway. With the exception of one - 73 Dodge (google map). Brendan Mehaffy, Executive Director of the Mayor's Office of Strategic Planning, has issued a temporary stay of execution for this heritage Midtown property, steps from the Summer/Best LRRT station. The community has until June 30 before the bulldozers roll. This property is available for $1 to a qualifed owner occupant. Contact me for additional info. 73 Dodge Street image archive. This house is one to save! 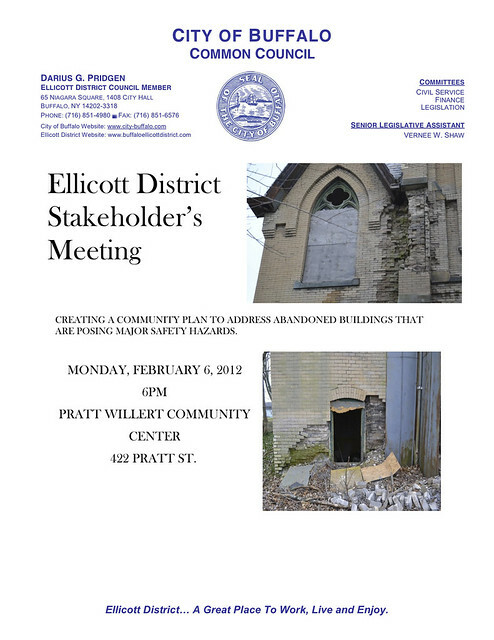 Ellicott District Councilmember Darius Pridgen is holding an Ellicott District stakeholders meeting about the fate of a number of abandoned buildings in on the City's East Side. This flyer - with pictures of the Salem Church at 413 Sherman Street - was distributed to residents in the Ellicott District late this afternoon. 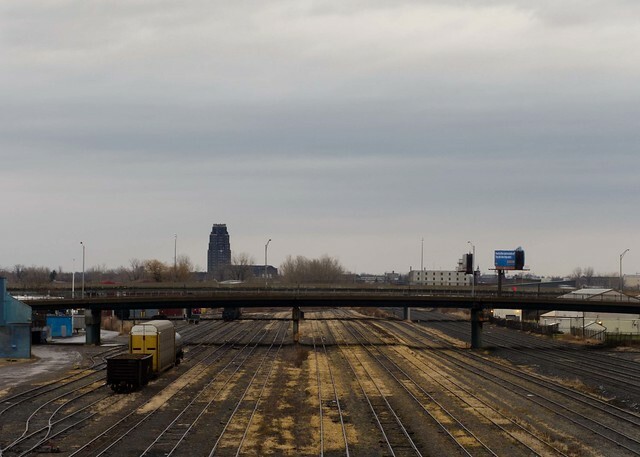 If you're interested in the fate and future of some of the City's most impressive and sensitive heritage buildings - commercial, industrial and religious - plan to attend the February 6th meeting. To see the individual photos and related maps, follow this link or you can also view the series as a slideshow. Four years ago I posted this post/pic, showing a brand new sign at the corner of Jefferson and Best. I've passed through this intersection hundreds of times since. I haven't seen any changes. I snapped this new pic last week. City records indicate the City of Buffalo still owns a number of parcels at this corner. An entity known as "Robbed of our Youth" purchased one of these parcels, fronting on Jefferson, shortly after this sign appeared in January 2008. Does anyone have a clue as to what is happening (or not) at this corner? The Salem Evangelical Reformed Church, located at 413 Sherman Street, was designed by Buffalo architect Jacob Oberkircher and built in 1907 (google map). Oberkircher's church replaced this wooden chapel that established this German congregation in the neighborhood in 1873. Fast forward 100 years. The pattern is familiar. Like with many of the East Side's heritage religious structures the people who worshiped here left long ago and the minister who lead the congregation can not be located. Salem has been on my radar for a number of years. Last year I ventured inside, following a well-worn scrapper's path. I was awed. There wasn't one piece of broken or missing stained glass. The pews were mostly intact and the bell could still be rung with a rope that was strung to the tower. Records kept by the original German congregation were still on the shelves next to hymnals and various historical records probably belonging to members of the original congregation. Now, the series of pics - individually or as a slideshow - show a new story. 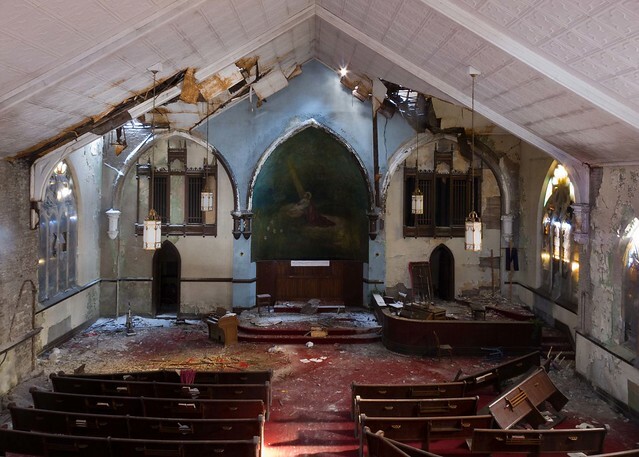 The stained glass is now missing, the pews are in disarray and parts of the brick facade are crumbling in multiple locations. I stopped by City Hall the other day and sat down with Ellicott District Councilman Darius Pridgen to talk about this church. I told him about the multiple entry ways. I told him about the missing stained glass and the crumbling tapestry behind what's left of the altar. Three days later all the entrances were boarded. Yesterday the front door was open. I've been told by neighbors that Sunrise Congregation - the current owner of record - could no longer afford to heat the church, so services were held in the former minister's residence, adjacent to the church. That residence was demolished three years ago. I haven't heard yet, who paid for that demolition. 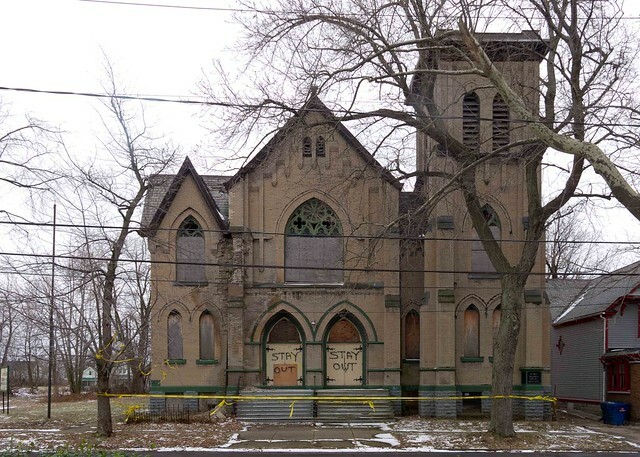 If there's an inventory of threatened religious structures in Buffalo, Salem needs to be added to the list. The roof will continue to fail. Bricks will continue to fall. 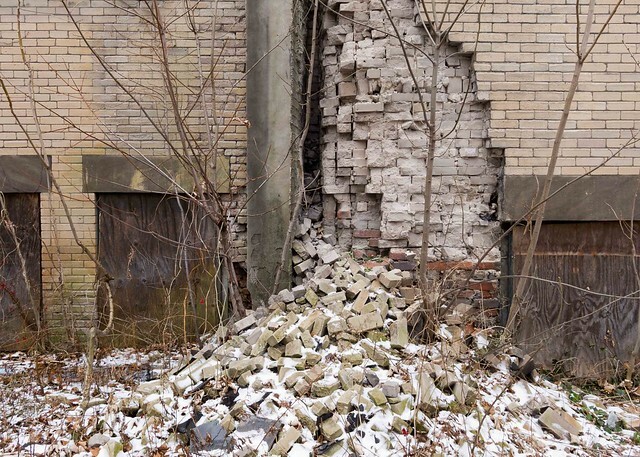 Much like the "demolition by neglect" of Christ Evangelical Luthern Church at the corner of Broadway and Fox (2005) or the collapse of the school building at Sacred Heart on Emslie (2008), near Clinton - Salem Church is likely to meet the same fate. Soon. Additional historical images: view as a set/individually or as a slideshow. Update January 20, 2012 - a number of local preservationists decided to padlock the church's front door. This was done in an attempt to help safe-guard the numerous religious and heritage elements still present inside this church. 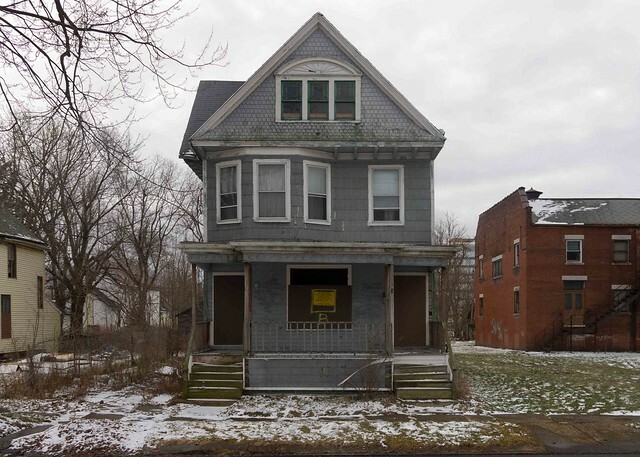 1370 Michigan Avenue: City-owned and "Occupied"
Members of a local Occupy Wall Street group - Occupy Western New York - contacted me recently and asked about a number of housing opportunities in the neighborhood. We discussed several possibilities. Here's what 1370 Michigan looks like today. 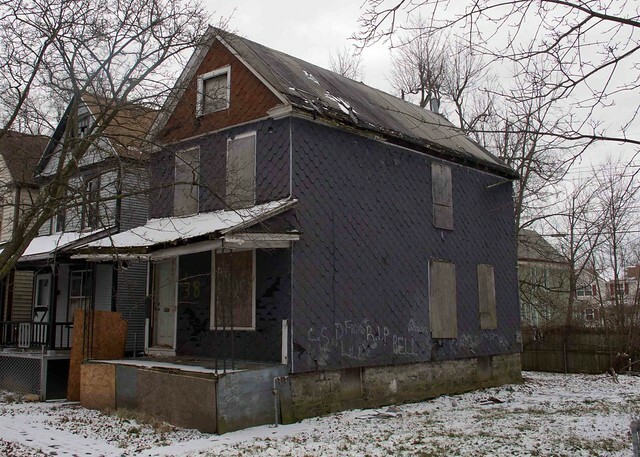 At Thursday evening's General Assembly they decided to go forward and "occupy" 1370 Michigan Avenue, a house the City had previously offered as $1 homestead eligible property. 1370 Michigan was acquired by the City three years ago in a tax foreclosure proceeding. Two months ago the City wanted to demolish this two-family house. It's located in a section of Midtown that's experiencing considerable grass-roots investment and support. A small group of neighbors and City residents surveyed the house and pursuaded the City not to demolish the property. 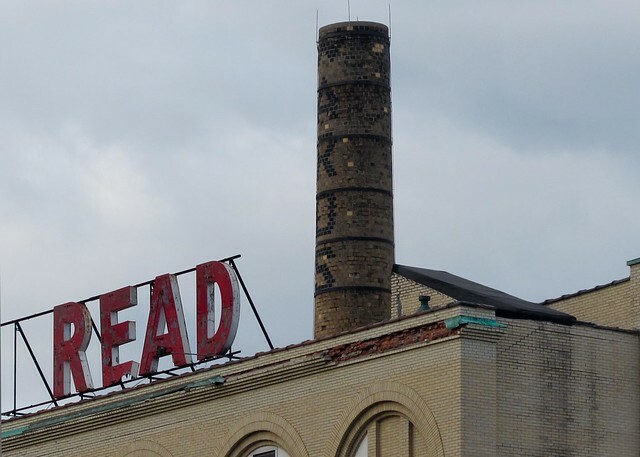 Two years ago the WONDER BREAD's N went missing, months later then the B. In October copper flashing was stripped from one of the East Side's most iconic steel-reinforced concrete industrial buildings. 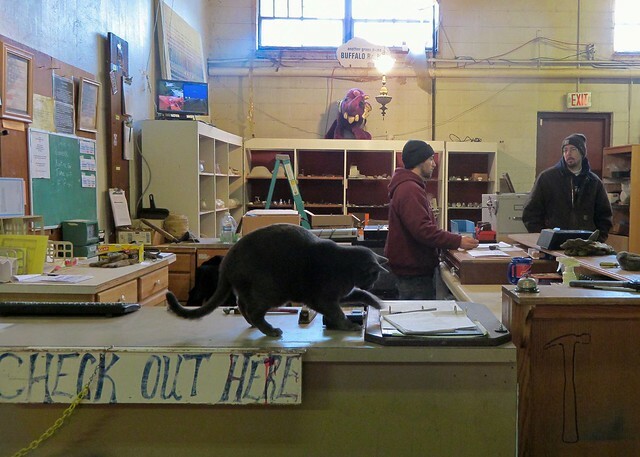 The building's owner pointed a finger at the tenant, East Side activist Darnell Jackson. Things got ugly. The Buffalo News covered the crime. I noticed the missing copper flashing the other day and snapped this pic. Copper trim was stripped and scrapped from Genessee Street's City-owned Brecker Building, located where High Street meets Genessee. 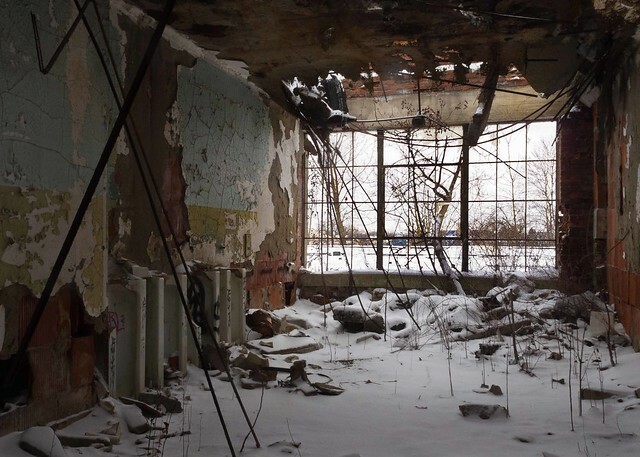 It's an amazing concrete building that used to house the Curtiss-Wright training school. The building's fenestration is sublime. Compare the pre-scrapping 2005 image with a more recent image from 2010. The owner of St. Matthew's stripped the flashing from one of East Ferry Street's most neglected heritage buildings. Mike Puma covered that story for Buffalo Rising. Some additional pictures of the missing copper are included in this archive about St. Matthew's. Copper prices are high and expected to go higher this year. 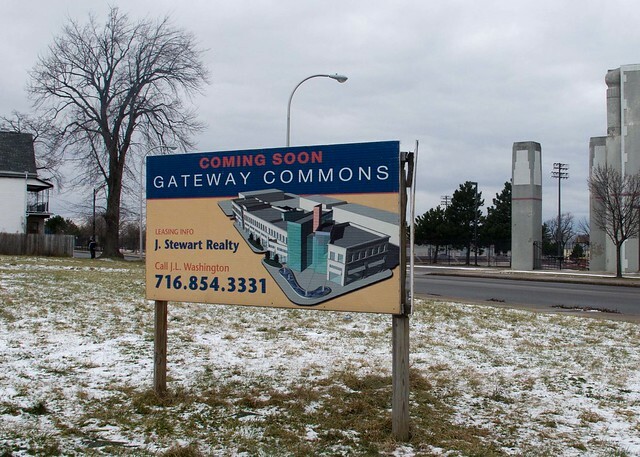 With sites such as ScrapMetalJunkie providing plans for copper scrapping - it's hard to believe that more of Buffalo's architectural detail won't disapper in 2012. Are there additional stories of scrapped and stripped buildings and facades? What are other Cities doing to prevent this from happening? Ada Place is a unique Queen Anne lined one block Street on the City's East Side (google map). It is the sister to Coe Place in Midtown. Ada Place is exactly what it sounds like - an authentic place - something that is increasingly rare in this age of mass commodification and replication. It is a place that can not be replaced. Rev. Stenhouse's organization Bethel Community Development Corporation purchased 38 Ada Place in 2002. Three years ago I included a post about 38 Ada Place in a six part series about a failed neighborhood housing plan. Rev. Stenhouse wanted to be part of that plan. 38 Ada Place looked like this in March 2009. Rev. 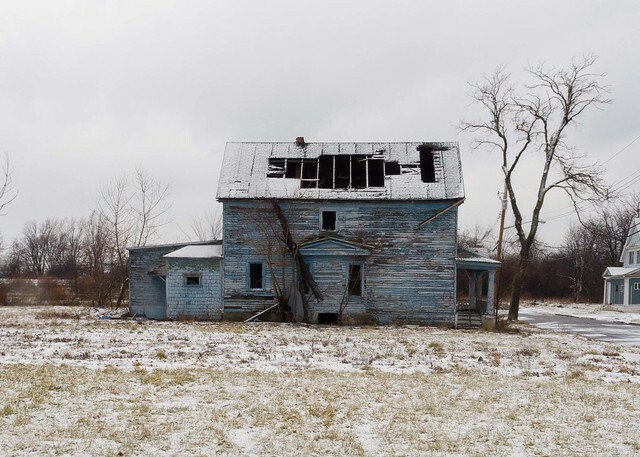 Stenhouse was invited to Housing Court for his failure to properly maintain a string of houses across the street from his Bethel AME Church, near the corner of East Ferry and Michigan and directly across the street from one of the City's newest school renovations - Performing Arts. He later resigned from the Buffalo Fiscal Stability Authority when he plead guilty in Buffalo's Housing Court in 2007. He'd been appointed by Governor Pataki to be the Control Board's Secretary and Treasurer in 2004. What happened to that failed neighborhood housing plan? It's dead. Rev. Stenhouse and his now defunct Jeremiah Partnership are defendants in a Federal "Pay-to-Play" lawsuit. Here's a copy of that lawsuit filed on behalf of a Cleveland Ohio based developer NRP Group in June 2011. According to public records the Jeremiah Partnership failed to file the required 990's for three consecutive years. The IRS has revoked its exempt status. Calls to Bethel CDC and Rev. Stenhouse were not returned this week. The future of 38 Ada Place remains uncertain. Here's a look back at some of the places I've seen this past week. To see this week's photographs, please follow this link. The entire Seeing Buffalo collection is available here. One of Buffalo's favorite East Side non-profits, Buffalo ReUse, moved late last year to their new location at 296 East Ferry (google map). Challenger News wrote about the move, here. This change represents a solid step forward for an organization that's been struggling to overcome a number of obstacles. The new store is conveniently located in a neighborhood that's part of the East Side's strongest retail and commercial centers. There's plenty of parking near the store's entrance and donation drop-off door on Dupont Street. The deals are rather extraordinary. If you're a homeowner, landlord, property manager or local contractor, I encourage you to stop by on a regular basis. The stock is always changing and the pricing is considerably less than anything you might find at big box retailers or supply houses. I noticed 100's of square feet of old tin ceiling - see slide show - the other day. It's the perfect material for that ceiling renovation project you've been considering. Here's a short slide show of some additional items. The Board of Directors at Buffalo ReUse has asked me to be the organization's official photographer. I'll be collecting images in this flickr set - Buffalo Reuse East Ferry Street. fixBuffalo readers can look forward to frequent updates as I visit and photograph on a regular basis one of the East Side's most ​exciting and progressive organizations. Seeing Buffalo is a series of photographs shot, edited and posted on a weekly series. The focus is the City's East Side; the the largest geographic and often least known and understood part of the City. If you're not familiar with the locations you can see them on the flickr map next to each photo. In some cases I've provided a description or links to additional information about the location. The photographs are cross posted on the fixBuffalo flickr site, Seeing Buffalo. The weekly series will be archived in this post.